After the old town hall (located between Abington Street and Wood Hill) became too small due to growing demands a competition was held to find a new design for a new building in St Giles Square. The winning entry was submitted by E.W. Godwin from Bristol. 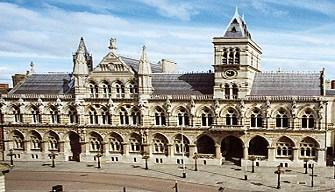 This building is now the Eastern part of the present Guildhall and was finished in 1864.